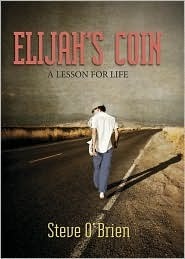 Elijah's Coin is a stirring and inspirational story about humanity and doing what is right even when it seems wrong. Its a story about paying it forward, about evoking kindness and how, in order to receive, you need to give. Tom's life hasn't been the same since his mother's brutal murder. He can't seem to stay focused and finds himself on a path of self-destruction. He sets out one night to rob a warehouse and instead he meets Elijah King, who sets him upon a new path that will change Tom and those around him, forever. Handing Tom a coin, Elijah has Tom promise they will meet for three nights whereupon, Elijah will show Tom the error of his ways. On the third night, Elijah doesn't show and frantically, Tom follows the clues from the words Elijah said during their talks, to track him down. What Tom finds at the end of the trail isn't quite what he expected, but the lessons he learned along the way, help Tom put his life back in order. I really enjoyed this book, I liked the spiritual message the book shared. Observe. Think. Believe. Act. Steve O'Brien explains this thought-provoking subject in a fresh way that I'm sure all will enjoy. The book is aimed at younger audiences but I feel everyone can walk away with a message from this book. Elijah's Coin will make you laugh, cry (okay, well, it made me cry...LOL) and best of all, it will make you think. A thoughtful fable about one young man's descent into a life of crime... until he discovers an unlikely mentor, who begins to teach him a new philosophy of life. It's a philosophy not so much of words as of deeds. Hi, stopping by from Z's Space Reviews to follow back and enter some giveaways! Followed you on everything I seen! Thank you for the follow and entries!